Here once stood other three temples: E, F, G. The last one (probably dedicated to Febo or Zeus) is one of the biggest in the classical age. It is 110 metres long and about 50 metres wide. 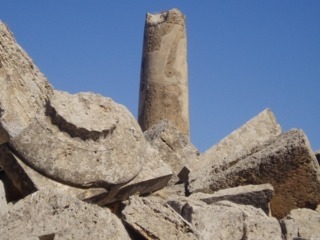 The columns are 16 metres high and their diameter is about 3,41 metres. The construction of this temple had never been completed even if began a long time before the building of the others. The material used came from the Cusa Quarries, located at about ten kilometres north-west from Selinunte, where we can still admire signs and traces of a glorious past. 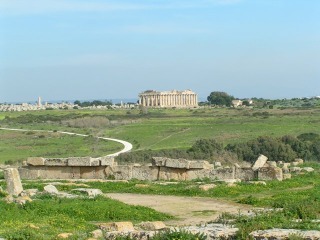 Southwards, there is the temple “F”, built in the mid of the 6th century B.C. It was decorated with metopes, two of which quite ruined, are kept in the archeological Museum of Palermo. 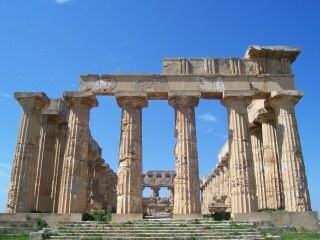 Then follows temple “E”, probably dedicated to the goddess Hera, its construction goes back to the first half of the 5th century B.C. 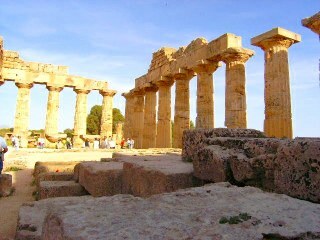 Its architecture marks the apogee of the Doric canonical style. The frieze of the pronaos was decoarated with sculptured metopes, five of which can be found in the archaeological museum of Palermo. At the end of the fifties the temple was completely rebuilt. The time of the old: An old popular belief says that the inhabitants were Selinuntini giants. The Park stands majestic and solitary a column 16 meters high with a diameter at the base of nearly 3 meters, which the locals affectionately call "Lu Fusu of the Old", because according to them was to serve the huge and ancient filatrici as time for spin wool. Anastolis Temple E: done around 470/460 BC, the temple is visible today thanks to partial "anastolis" (party falls) who have returned to culture and admiration of the world.